Versatile is the best word to describe musician Ralph Grierson. 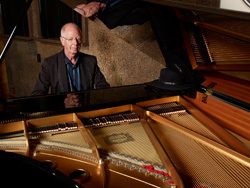 His talent, on a wide variety of keyboard instruments ranging from the traditional piano and harpsichord to the most advanced computer synthesizers, has impressed and delighted audiences for many years. His ability to convincingly perform classical music, jazz, rock ‘n roll and contemporary avant garde electronic music has put him at the musical forefront. Born near Vancouver, British Columbia, Grierson began studying music at the age of five. From the time he was 13 until he left Vancouver at 20 to attend the University of Southern California, he paid for his music lessons by playing piano for chorus line rehearsals, live radio and television shows for the Canadian Broadcasting Corporation and various night clubs in Vancouver. While attending USC on a scholarship, he studied with John Crown and Ingolf Dahl and received a bachelor’s of music degree and a master’s of music degree. While at USC, he met another talented student, conductor Michael Tilson Thomas. The two friends would later find themselves collaborating on several important, successful works, including Stravinsky’s four-hand piano reduction of The Rite of Spring. Since graduating, Grierson has performed with the Los Angeles Philharmonic, worked with conductors, composers and musicians like Michael Tilson Thomas, Pierre Boulez, Lukas Foss, Aaron Copland, Steve Reich, Morton Subotnick and Pinchas Zukerman. He has performed at Carnegie Recital Hall and The Kitchen in New York, and has been part of the prestigious Monday Evening Concerts, held in Los Angeles, and at the Ojai Festival. He recently traveled around the world with the London Philharmonia Orchestra and James Levine playing Gershwin's Rhapsody in Blue and Saint-Saens Carnival of the Animals for the premier of Disney's Fantasia 2000. He can be seen in the IMAX version of the movie and heard on the soundtrack album. Reviewing the soundtrack album, Mark Swed, Los Angeles Times says "...I can't think of a soloist that I would rather hear play Rhapsody in Blue." Recordings by Ralph Grierson include the previously mentioned Rite of Spring, in addition to the Grammy-nominated Palm Leaf Rag, and the follow-up album, Magnetic Rag, both with the Southland Stingers and both containing music by Scott Joplin. S’Wonderful, also nominated for a Grammy, highlights the music of George Gershwin. Three Dances and Four Organs, contains music by John Cage and Steve Reich, and For Ralph Grierson features compositions by Morton Subotnick, Fredrick Lesemann and William Kraft commissioned by Grierson. In addition, Ralph has had a brilliant career as a first call studio musician with thousands of hours of studio session work to his credit (see enclosed credits). For this work his peers have honored Grierson, frequently, and most recently he was presented with an Emeritus Award by the National Academy of Recording Arts and Sciences, which is presented only after being awarded three Most Valuable Player Awards. Grierson has delved extensively into experimental electronic music including several years spent working with the Los Angeles-based group, Ishtar. This interest plus that in classical music motivated him to compose such works as, Sometimes...Not Always, a forty-five minute/four movement video performance piece that premiered at the L.A. Theater Center. He has composed music for three television movies -To Find My Son, starring Richard Thomas, Red Earth, White Earth starring Ralph Waite and Genevieve Bujold for CBS, and The Hired Heart for Lifetime cable plus Islands in the Sun, a promotional film commissioned for the Tahitian Film Board and Conditioned Relaxation, A Guided Imagery CD in the field of Music and Health. Grierson is a talented composer whose music reflects his involvement with a myriad of musical styles. Whether composing for a film or the opening of a prestigious theatre complex, his compositions are the summation of a truly multi-talented, versatile artist. Since suffering a career-ending injury to his wrist, Ralph has renovated his home studio and is currently working on developing his own voice as a composer, and considers this the latest incarnation of an already eclectic journey from acoustic piano through electric keyboards, analog synthesis, digital synthesis to today’s virtual instruments. Ralph uses a Yamaha S6 Disklavier Pro and a Yamaha S90 as his main controllers for a studio, which now consists of multiple computers running Digital Performer and a host of plug-ins.